**Otterbine Air Flo3 Diffused Aeration Systems are custom built. Please call or email for the best pricing! Diffused air is a simple concept which entails pumping air through a pipe or tubing and releasing this air though a diffuser below the water’s surface. The Otterbine Air Flo 3 system has no visible pattern allowing landscape designs to remain serene and calm. Able to operate in depths up to and exceeding 40 feet, the Air Flo 2 is unique to the Otterbine aerators line as it uses quiet on-shore compressors that pump air to diffusers placed at pond bottom. Choose between stone diffusers or self cleaning dome diffusers, (dome diffusers are available as 4-dome, 2-dome or single-dome diffusers.) Diffusers release oxygen throughout the water column creating mass circulation that mixes bottom and top water layers and breaks up thermal stratification. Diffused air is a simple concept which entails pumping air through a pipe or tubing and releasing this air though a diffuser below the water’s surface. The Air Flo 3 system has no visible pattern allowing landscape designs to remain serene and calm. We also offer fountains by Otterbine that would be the perfect addition. The Air Flo 3 system is extremely effective in all ponds with a depth of at least 6ft (2m), and all the way up to of 40+ feet (12m) depths. It breaks down thermal stratification and stimulates bottom aquatic life which feeds on algae and organic nutrients. The Air Flo 3 system is ideal for managing water quality of effluent ponds and lakes without releasing harmful particulates into the air, and is excellent in breaking up thermal stratification in ponds and lakes. No parts of the system or a spray pattern are visible from the lake’s surface. Those concerned with evaporation favor the Air Flo 3 system since no water is released into the air. No electricity or moving parts are near the water; this makes the system entirely safe for swimming, boating, and fishing. Package electrically safety tested and listed with ETL, ETL-C. Products for European Union are also safety tested, approved and carry a 3rd party independent CE mark. Initial cost, maintenance cost, and operational costs are all relatively inexpensive. 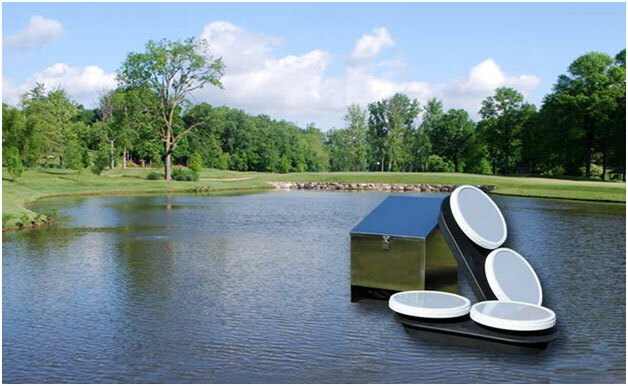 One Air Flo 3 System can be used for multiple ponds. Inexpensive in terms of both capital and operation costs. Otterbine is the only manufacturer to have oxygen transfer and pumping rates independently tested and published on their aeration systems.